By competing in races across the world, earning a spot in both the ITU and USA Triathlon Hall of Fame, coaching a new generation of athletes, and being named by Sports Illustrated as “the triathlete most likely to be eaten by a shark at the Sydney Olympics,” Karen Smyers has experienced the ups and downs of being a professional triathlete. By battling cancer and other life-threatening injuries, becoming a mother of two children, and trying to stay competitive, Smyers has also experienced many of the ups and downs of life. The origin of Smyers’ career as a professional triathlete can be traced back to a void that needed to be filled after finishing college at Princeton University. 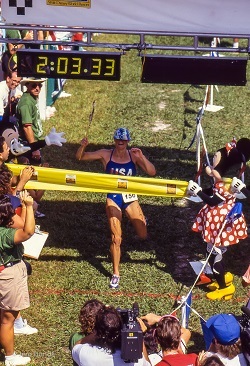 Triathlons were a hobby for Smyers in the early 1980s, while she had a full-time job as a computer consultant. When the company went bankrupt in 1989, she decided to take a gamble and race on the professional level full-time to earn prize money. Smyers did more than earn a few bucks during her career as a professional racer. In 1990, she won the first of two ITU Triathlon World Championships. She also won the first of her seven USA Triathlon National Pro Championships. In 1995 won her first Hawaiian Ironman world title before taking home her second ITU World Championship just five weeks later. She is the only woman to win the top two titles in the same year. However, Smyers’ career wasn’t solely highs. Injuries started to plague the later years of her career. In 1997, glass from a shattered window cut through her hamstring, sidelining her for the season. A year later, Smyers was hit by an 18-wheeler on her bike while training. She fought back, but on her second comeback raced crashed and broke her collarbone. A few days after the crash, Smyers faced her biggest challenge - thyroid cancer. After surgery to remove her thyroid gland in December 1999, she narrowly missed qualifying for the 2000 Olympic team. In 2001, Smyers surprised the triathlon world again with a comeback that included a fifth-place Ironman finish and ended with her seventh national title. Smyers was inducted into the inaugural class of the USA Triathlon Hall of Fame in 2009. Although it was a huge honour, Smyers still doesn’t consider it her biggest achievement. “The most rewarding aspect for me was being able to make a living at something that I never viewed as a job,” Smyers said. “Sports are my passion and to be able to do what I love and get paid for it, it is the best of all possible worlds.